What The Force Awakens lacked for Captain Phasma, Journey to Star Wars: The Last Jedi – Captain Phasma #2 more than makes up for and leaves you wanting more. In just two issues writer Kelly Thompson has made Captain Phasma and her escape from Starkiller Base one of the standout characters that we knew very little about after her debut in Episode VII. With little to go on Thompson does some very skilled writing in making Phasma stand out on her own. In issue two we understand her duplicitous nature and while her mission to stop Lieutenant Rivas is tinged with villainy Thompson has found a way to make us root for Phasma to get to Rivas and protect her secret. The issue also does something unexpected and takes Phasma’s out of her stand out chrome armor and into a wildly different outfit all while still maintaining the mystery behind the mask. While there is a slight tease that we will finally see who’s under the helmet the choice to keep her concealed was spot on. Phasma has chased Rivas with First Order pilot TN-3465 to the planet Luprora. Rivas is missing from his TIE and finding a village nearby Phasma decides they need to blend in to get the information on Rivas. Not wanting to use a trooper call sign, similar to when Poe gave Finn his name, Phamsa does the same but with far less creativity by naming TN-3465 “Pilot” and while not creative it’s a perfect fit for Phasma’s character. From here the issue stands on its own as a richly designed action adventure for Phasma with plenty of action, monsters, and mystery. 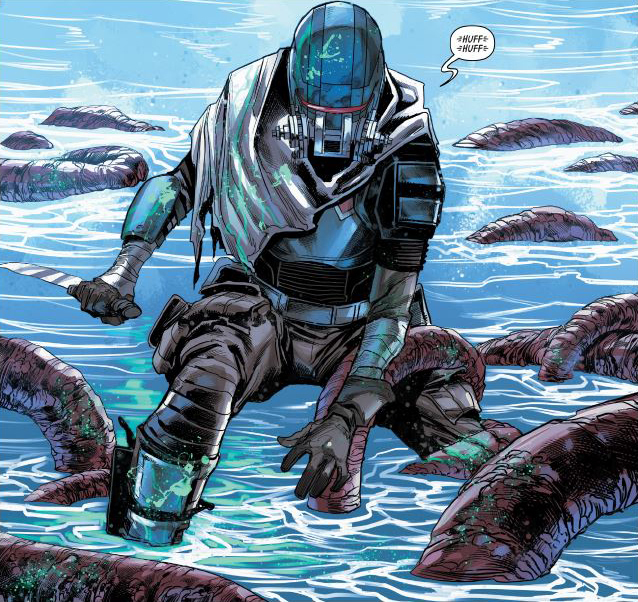 Marco Checchetto art is absolutely fantastic and enriches a story that is already fully engaging. His attention to detail and form is crucial to making Phasma more than just cool costumes. Because we don’t ever see Phasma’s face Checchetto must do more with Phasma’s actions and body language so that the audience connects with her and he does with great skill. The action sequences are so complex and detailed you want to review more than once so you get the whole experience. It’s a perfect for this title. Andres Mossa’s colors add the final stunning touch. The colors are so varied and rich that they are crucial to making all the elements of Checchetto’s work feel even more alive than they already do. Captain Phasma is now the character I was hoping to see and this series does such a good job making all the characters more personable and likable even when they do bad things. It deepens the mystery of Phasma while at the same time enriching her by expanding her beyond just being the chrome trooper. She’s still strongly a by the book military soldier but now we get to see more layers and complexity that the movies might not be able to provide. Captain Phasma #2 and many of the Star Wars titles shouldn’t be missed or undervalued if you love the universe building that books like this accomplish and you want more from seemingly one-dimensional characters. This title gives you all that and more. 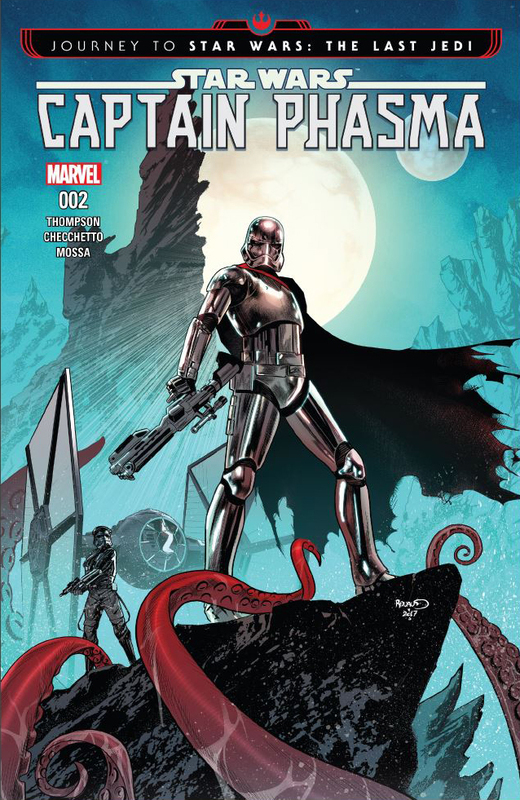 Captain Phasma #2 is a must read!